Be a beverage participant at the 10th Annual Taste of Cardiff! Do you have crafted beer, spirits, kombucha and/or wine? The taste of Cardiff is your opportunity to display your special brews, barreled wines, tonics and spirits to North County Communities. 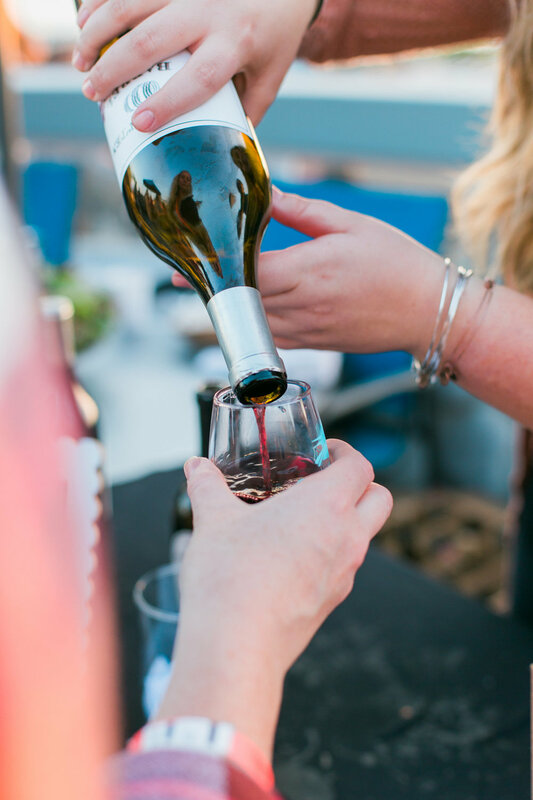 Over a 1,000 participants will be tasting and sipping in Downtown Cardiff-by-the-Sea to experience a personalized tasting room encounter with each libation. Promotions start in March for the event across a variety of media sources and social media outlets that guarantee all participating businesses extreme exposure. Cardiff 101 Main Street 10th Annual Taste of Cardiff will take place on Thursday, May 2nd, 2019. In 2018, The Taste of Cardiff was covered by local magazines, numerous newspapers, web-news and social media sites. The evening was enjoyed by Cardiff residents and provided invaluable exposure to our local restaurant community. Be a part of the fun and entertaining means of getting noticed. This event showcases and promotes your business prior, during and following the event. Cardiff 101 will be advertising your business and the event through a variety of social media platforms, public media channels and other sources. Day of event, ticket holders will stroll from sip stop to sip stop for a small taste that captures your unique beverage. During the evening, attendees will be voting for their favorite restaurant. Cardiff’s Golden Fork Award will be presented to the winner for display and announced to the community during and following the event. Only one sip per person per sip stop and once a sip is given to a ticket holder, one of your staff members or a volunteer (provided by us) will mark off their ticket. Plan to provide 2-3 beverage reps or servers, (1) 6-foot long table, and tablecloth. We recommend small sips (2 – 3 oz) to decrease your costs and to encourage attendees to try every sip stop. Encourage attendees to return by providing an offer (such as a coupon) that can be redeemed at a future date. ENTERTAINMENT for the event will be a variety of live music positioned throughout downtown Cardiff to enhance the evening’s atmosphere. EVENT PROMOTIONS will include Email blasts to thousands of people, social media, posters, banners and credentials with a map of participating restaurants in the hands of over 1,000 people. SIP STOPS are with Non-restaurant businesses that will be hosting local breweries and wineries that serve a wine or beer taste. Only registered establishments will be issued a one-day ABC licenses and permitted to be a sip stop. All alcohol and those drinking alcohol are to remain in sip stop establishments. No alcohol is to go into the courtyard area at anytime. TICKETS will be sold for $30/person (non-alcoholic) or $40/person with sip stops included. A total of 1000 tickets will be available this year. Each participating restaurant will be issued two complimentary tickets to distribute as they please. Tickets will go on sale April 5th and will be available to purchase online at www.cardiff101.com. Any revenue generated from the Taste of Cardiff is used to enhance the well-being of our community and sustain Cardiff-by-the-Sea as a desirable place to live, work, shop, and play. If you would like further information about the event and participation, please contact roberta@cardiff101.com. Thank you in advance for your participation in what has already become a “Taste Tradition” for Cardiff-by-the-Sea. Complete the steps if your interested in having your libation be a "Sip" at the 2019 10th Annual Taste of Cardiff.Please by February 24th, 2018 to be included in all marketing materials. Step 1: Please fill out the SIP APPLICATION by February 24th to participate. Yes! My beverage company will participate in the 9th Annual Taste of Cardiff on May 2, 2019 held between 5:00 - 8:30pm. Space Availability & Confirmation: Space & sip stop pour location assignments will be made as applications are received. Beverage Space: The vendor space will be a participating non-restaurant Cardiff business located in the Cardiff downtown area. Please note the following: * As a participating beverage vendor, you will need to provide enough 2-3oz. "sips" to cover the number of ticket holders. Current total anticipated attendees will be 1,200. * You will need to bring 2-3 beverage reps or servers, (1) 6 foot table, and table cloth. * Cardiff 101 Main Street will acquire the ABC Daily Use Permit for each Sip Stop location. * No vehicles are allowed to park in the downtown center parking lot. You are required to handcart supplies to your assigned location. * Event Set Up will be on May 3rd from 4:00pm. Be ready to pour your first sip at 5:00pm. At the end of the event, your space must be clean and vacated in a timely manner. * All alcohol needs to be consumed inside the establishment that you are assigned. NO ONE WILL BE ALLOWED OUTSIDE WITH ALCOHOL. Restrictions: No stolen merchandise, firearms, ammunition, drugs or drug paraphernalia are allowed at or near the event area. No offensive materials, photos, pictures or merchandise is allowed. I will submit photos of my libations and company logo to hello@cardiff101.com for promotional use. I hereby waive & release, indemnify, hold harmless and forever discharge the City of Encinitas, Cardiff 101 Main Street, their agents, employees, officers, and directors, affiliates, successors, and assigns, of and from any and all, claims, demands, debts, expenses, causes of action, lawsuits, damages and liabilities, of every kind and nature, whether known or unknown, in law or equity that I have or may have, arising from or in anyway related to my participation in any events or activities conducted by, on the premises of, or for the benefit of the Cardiff 101 Main Street, providing that this waiver of liability doesn’t apply to any acts of gross negligence, or intentional, willful, or wanton misconduct. City of Encinitas Zero Waste Policy Compliance: By signing this agreement, I understand that the distribution of polystyrene products (Styrofoam) and single use plastic bags is prohibited at this event (IAW City of Encinitas Municipal Code). I agree to minimize the use of single use water bottles and individually wrapped products (e.g. ketchup/mustard packets). I agree that all recyclable products including but not limited to cardboard boxes, paper, plastic containers and bottles will be placed in appropriate recycling containers, and vendors will remove all products, debris, etc. and leave nothing behind at the event site. When you participate or attend Cardiff 101 Main Street events, you enter an area where photography, audio, and video recording may occur. By entering the event premises, you consent to interview(s), photography, audio recording, video recording and its/their release, publication, exhibition, or reproduction to be used for news, web casts, promotional purposes, telecasts, advertising, inclusion on websites, social media, or any other purpose by Cardiff 101 Main Street and its affiliates and representatives. Images, photos and/or videos may be used to promote similar Cardiff 101 Main Street events in the future, highlight the event and exhibit the capabilities of Cardiff 101. You release Cardiff 101, its employees, volunteers, members and each and all persons involved from any liability connected with the taking, recording, digitizing, or publication and use of interviews, photographs, computer images, video and/or or sound recordings. By entering the event premises, you waive all rights you may have to any claims for payment or royalties in connection with any use, exhibition, streaming, web casting, televising, or other publication of these materials, regardless of the purpose or sponsoring of such use, exhibiting, broadcasting, web casting, or other publication irrespective of whether a fee for admission or sponsorship is charged. You also waive any right to inspect or approve any photo, video, or audio recording taken by Cardiff 101 Main Street or the person or entity designated to do so by Cardiff 101 Main Street. You have been fully informed of your consent, waiver of liability, and release before entering the event(s). Thank you for submitting your sip application. We appreciate and look forward to your participation! It's your support that makes the Taste of Cardiff fun and a success. Step 2: Review the checklist, these are items you will want to make sure you bring to the event. Step 2: Get your Business Promoted!